The Geological Society of America will award the 2015 Doris M. Curtis Outstanding Woman in Science Award to Priya Ganguli, who earned her M.S. and Ph.D. degrees in Earth and planetary sciences at UC Santa Cruz. The award recognizes Ganguli, now at the Woods Hole Oceanographic Institution, for the impact of her Ph.D. research, which shed light on many unknown and uncharacterized processes that influence mercury dynamics in coastal ecosystems. Her work has created a rapidly growing area of research. After earning her master's degree in 1998, Ganguli worked for the San Francisco Bay Regional Water Quality Control Board as a geologist and environmental specialist, working on large-scale mine-site and wetland remediation projects, before returning to UCSC to pursue her Ph.D. For her master's thesis, Ganguli studied mercury in acid mine drainage from the abandoned New Idria mercury mine, now an EPA superfund site. 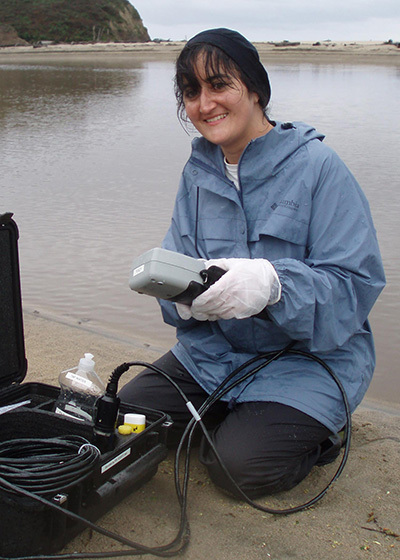 Her Ph.D. thesis focused on mercury contamination in coastal groundwater and the ocean. Russell Flegal, professor of microbiology and environmental toxicology, was her advisor for both degrees. Ganguli will be honored during an awards ceremony on November 1 at the GSA's 2015 Annual Meeting & Exposition in Baltimore. The Doris M. Curtis Outstanding Woman in Science Award is awarded annually to a woman who has impacted the field of the geosciences in a major way based on her Ph.D. research. Doris Curtis was the GSA's 103rd president. Her popularity was widespread and she pioneered many new directions for geology, not the least of which was her tenure as GSA president after an unbroken chain of 102 men.